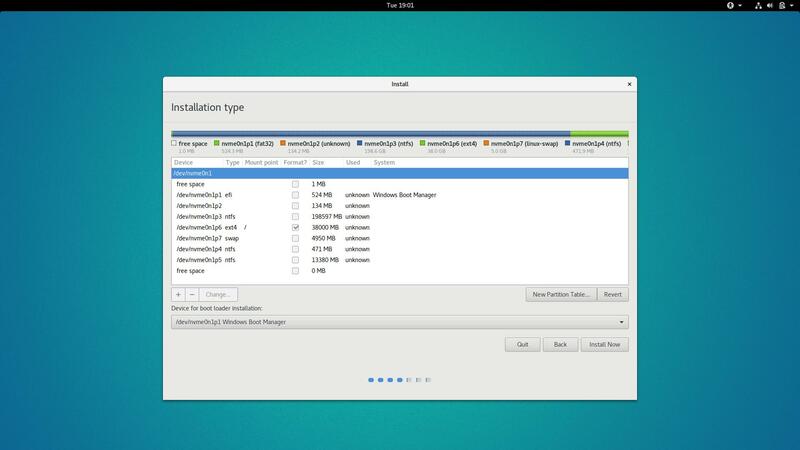 I want to install Ubuntu Gnome alongside Windows. I made two partitions, one ext4 and one swap partition. For the bootloader I chose the /dev/nvme0n1p1 partition, which is my Windows-EFI-Partition. Just to document FAT32 ESP - efi system partition issues and possible fixes. First try either chkdsk from Windows or dosfsck from Linux on the ESP - efi system partition which is FAT32 formatted. Where X is drive and Y is partition, often ESP is first partition on sda or sda1. But some new drives are NVMe devices where drive is nvme0n1 and full drive & partition (p1) is /dev/nvme0n1p1. Some cases require full back up of the ESP which is always a good idea before doing anything anyway, deletion of the FAT32 partition with gparted and then use gparted just to recreate it, format as FAT32 and it must have boot flag to make it the ESP. Restore boot files. But you may have to reinstall grub or use efibootmgr to add entries as UEFI uses GUID which new partition will have new GUID. Not the answer you're looking for? Browse other questions tagged dual-boot grub2 uefi or ask your own question.